Increase staff quickly- At Appleseed, we can help you find top notch summer workers to fill those gaps created by employee vacation time. It’s also a great way to handle seasonal fluctuations caused by an increase in local customers resulting from better “getting out” weather and, in some areas, seasonal tourist traffic. Find specialized help-Temporary workers are also an ideal solution for seasonal employers such as landscapers, fencing companies, construction contractors, and pool installers who might need more specialized employees. 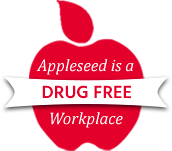 Appleseed can help you find the skilled seasonal help you need. Attract new talent- With the recent economic downturn, there are still quite a few workers available for the right jobs. Many might be attracted to temporary opportunities that would allow them to explore different types of employment before settling into a full time position. It is a great way for our clients to make sure we have found the right employee for your needs. As summer continues to heat up, so does the potential for needing some summertime help, now and in the weeks to come. Even if summer is not a peak season for your company, temporary full-time and part-time help is also the perfect solution for any sudden gaps in staffing needs..
All this means summer’s a great time to contact Appleseed to learn more about how we can help you with your seasonal, part-time, and temporary employee needs.